Palette Contemporary Art will appear at Palm Springs Modernism! Palette Contemporary Art and Craft will appear at the 19th Annual Palm Springs Modernism Show and you’re invited! As in the past, this event will be held at the Palm Springs Convention Center. It will run Saturday, February 16 (10 AM - 6 PM), Sunday, February 17 (10 AM - 5 PM), and Monday, February 18 (10 AM - 4 PM).Tickets are available at palmspringsmodernism.com or at the door. Our Palm Springs Modernism booth will exhibit our growing collection of Cuban paintings from the 1950s and 1960s. Our display in this area concentrates on Jose Mijares, one of roughly ten artists featured in David Zwirner’s 2016 book, “Concrete Cuba”. Upon acquisition of these paintings, we hired Luis Neri Zagal, licensed specialist, to restore and conserve these paintings. Luis found a clear compound with somewhat the consistency of rolled-up balls of worn caulk on the surfaces of these paintings. Coupled with painting repairs made on top of this clear material, these paintings displayed unwanted stains and textured surfaces. Painstakingly, Luis removed the misguided painting repairs and clear coatings. Once this “debris” was taken off, these paintings were returned to their original luster and compositional intent for you to view. Architect and painter Fred Pichon’s creations delve into his personal interests of design, architecture, and mid-century history. Previously, his architectural leaning paid homage to Corbusier’s “Villa Savoye” whose images Fred dissected, colorfully re-created, and covered with a resin clear-coat. His gleaming coats of resin have now been applied to his paintings of yesteryear’s neon signs featuring Vaughn, New Mexico’s “Western Motel”, and the “Oasis Motel” in Tulsa. (The Oasis Sign has a secret which you must see in-person!) His Carlyle Motel, a composite painting, owes its foundation to a 1950s Arizona motel, possesses an eternally alluring California swimming pool, and its motivation is to portray a typically hot and sunny Palm Springs afternoon. Fred’s ready to take reservation for your stay at the Carlyle! Czech glass artist Karel Wunsch (1932) began his studies at the glass school at Novy Bor from 1946-50. From 1959-69, he designed a wide range of engraved, cut, and enameled pieces at the Novy Bor Glassworks. Since 1970, Karel has been an acclaimed independent glass designer and artist. He currently owns his own art gallery in the Czech Republic. History aside, Karel is best-known, today, for his work that combined modern, angular, and jagged cuts with colored glass casings for effect. 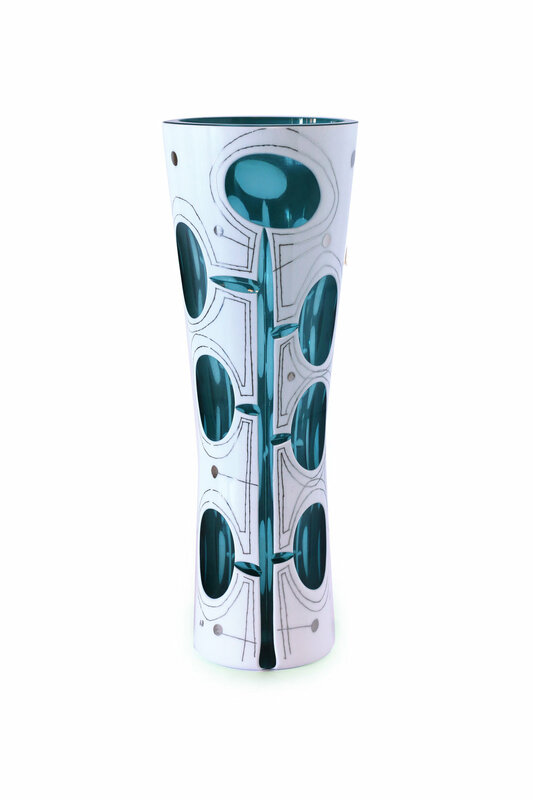 His pictured 1960s layered vase is green underneath with a white-enameled casing that delivers dramatic design that almost appears to be “Dr. Seussical” in style! Karel has also produced a number of single-layered vases with geometric designs which will also be on display. 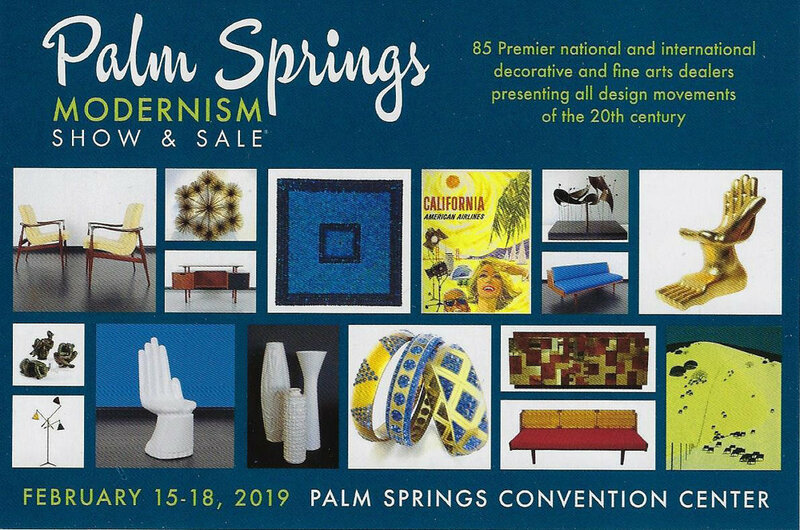 We look forward to both showing you our items as well as to visiting with you during February 15-18, 2019 at the Palm Springs Modernism Show (palmspringsmodernism.com) in our booth at the Palm Springs Convention Center.